Speed Energy Stadium SUPER Trucks championship leader, Matt Brabham returns to the streets of the Motor City, Detroit for the fifth round of the series this weekend. 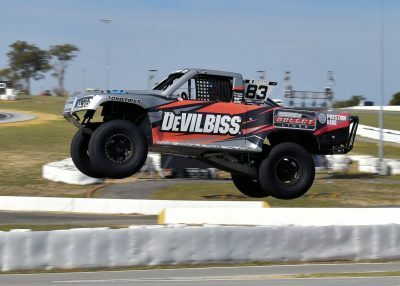 The DeVilbiss Racing entrant will be defending his championship lead after his recent victories in Perth (West Australia), Long Beach (California) and Adelaide (South Australia). The international racer who splits his time between the Gold Coast, Australia and Indianapolis, USA has had race wins in the past on the tricky street circuit of Detroit. On his first outing in Detroit in 2016, Brabham clean swept the weekend with two wins. Last year he had two strong podium finishes with a 3rd and 2nd respectively across the weekend. Brabham’s solid start to the year has rocketed him ahead of second-placed Gavin Harlien by 34 points. Amazingly second to eighth in the championship is covered by just 30 points. Last year, Brabham finished second in the championship by a single point to fellow Australian competitor Paul Morris, who will also be competing in Detroit. The third generation racer is focussed on bringing home maximum points in Detroit in his Preston Rentals-backed truck to maintain his impressive lead. After this weekend, Brabham will have just a few days to recover before heading to the Texas Motor Speedway for a spectacular night race, which is also on the same program as IndyCar on June 9. Brabham will then return to Australia to continue his preparation for this year’s PIRTEK Enduro Cup for Supercars, where he will co-drive with Lee Holdsworth in the Preston Hire Racing Commodore. Brabham’s 2018 campaigns are supported by the Preston Group, DeVilbiss, Gale Pacific, Coolaroo, The Boat Works, PIRTEK and the Chris Kyle Frog Foundation, of which he is a proud ambassador. “This weekend in Stadium SUPER Trucks it is all about maintaining my championship lead and coming away with the most points that I can,” said Brabham. “It’s a tricky, bumpy track and for the last couple of times I’ve been here it’s rained, so if we get some dry running it will be interesting. “It’s great coming from a Supercars event to an IndyCar event with Stadium SUPER Trucks because the atmosphere’s more or less the same, everyone’s just as excited to see us on track. Next Story ARC heats up at Canberra's Netier National Capital Rally Previous Story Tales from the paddock - Edoardo Mortara: "After a difficult year like 2017, you have your doubts"